I will provide my prescription later. Click the button below to add the Add a Prescription to my Gold & Wood Frame to your wish list. We offer the finest high quality lens technology available today. All of our prescription lab work is done through Essilor, the world's leader in ophthalmic lenses. Listed below is a wealth of knowledge on vision types, lens materials and the lens options that we offer. We have made adding lenses into your new eyewear very easy. On the frame page simply click the + Add Lenses button and it will bring you to the lenses section below. 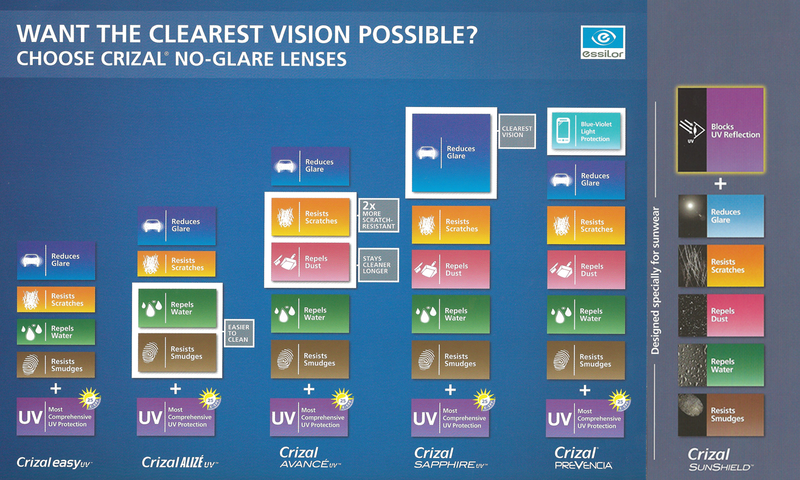 Here you can choose the lens material, vision type, and/or any options you desire for your new lenses. Once you have made your selection click the + Add to Shopping Bag button and your lens options and frame will be added to the shopping bag. The lens and options you choose is for one complete set of lenses; left and right eye. At the bottom of this section you can input your prescription. You have the option of either uploading your prescription (recommended), input your prescription in the fields provided or click to provide it to us at a later time. PLEASE NOTE: Your prescription must include your O.D. (Right Eye), O.S. (Left Eye) and your PD (Pupillary Distance) Measurement. Lab work typically takes 7-10 business days from the date the frame is in stock. We understand the value of your new look and vision, if you prefer you can always contact us to speak to an optician over the phone or by email. We want you to be as comfortable with your decision as possible. If you have any special requests regarding the lenses in your new frames or if you desire a specific brand of lenses please do not hesitate to ask. We work very closely with our lab technicians and they are able do practically anything with a lens. Just need new lenses? Click HERE! If we make prescription lenses for your new frame and if they are not correct in any way, we stand by our work and will remake them for no charge within 30 days at no charge. This will not go against your lens warranty and we will pay for your return shipping. Single Vision: A regular vision that only has one focal point. Helps wearer to either see near or far but cannot do both. - Nearsightedness (Myopia): A refractive disorder. In this condition, the eyeball is too long, meaning the eye cannot focus on faraway objects. It is commonly accepted that a combination of genetic and environmental factors play a role. Nearsightedness is much easier to correct through refractive surgery than farsightedness. Most ocular surgeons agree that due to the nature of the surgery, most patients need reading glasses past the age of 40. - Farsightedness (Hyperopia): It is the opposite of nearsightedness. The eyeball is too short and cannot focus on near objects. Unlike nearsightedness, it generally believed that only a person's genetics determine whether he or she will develop this condition. Corrective lenses are the most common treatment. Bifocal (Presbyopia): The lens is divided into two segments which offers distance viewing on the top and near vision on the smaller lower segment. You can see visible lines depicting the division of sight distance. Progressive: Also known as trifocal, no-line bifocal, PAL or multifocal lenses. Offers the same functionality of a bifocal lens but allows smoother transition between the focal points. No visible line to separate the different prescription. Plano (Non-RX): These lenses have no degree. They're basically just clear Plastic, Polycarbonate or Trivex lenses. Used in accessory glasses or to add a custom tint to a lens when a prescription is not needed. We use Essilor lenses as our standard for ALL single vision prescriptions, unless requested otherwise. Essilor Single Vision Lenses: Essilor single vision lenses are available in several different materials, such as polycarbonate, plastic or high-index. With ordinary plastic lenses, a strong prescription can result in thicker, heavier glasses. In contrast, high-index lens material will reduce thickness for greater comfort and a better appearance. Three factors generally guide the selection of which material is best for you: your vision correction; your lifestyle; your own personal preferences. These will help determine whether you would prefer an ultra-light material, a high-impact resistant material, a combination of both, or simply an ordinary plastic lens. Upgrade from Essilor single vision lenses to either Eyezen or Essilor 360 digital lenses for the absolute best in today's single vision digital lens technology. Essilor Eyezen Digital Lenses: Eyezen+ lenses are an upgrade from your everyday lenses that help defend against Harmful Blue Light emitted from digital devices and eye strain. With our Smart Blue Filter™, your lenses will appear clear in color to all those discerning eyes around you. Eyezen lenses have a blue-violet filter that blocks at least 20% of Harmful Blue Light, and are enhanced to increase clarity and help prevent eye strain while you’re going about all your gaming, texting, internetting, etc. Eyezen lenses also have SmartFocus™ technology — a slight magnification to lenses to help your eyes stay relaxed when reading and watching on a digital device. Essilor 360º™ Digital Lenses: Essilor 360º™ Digital Lenses with W.A.V.E. Technology makes the lenses a superior option for ametropic patients who demand the best visual experience. Essilor’s proprietary W.A.V.E. Technology applies a similar technology to that used in laser refractive surgery to virtually eliminate aberrations with a precision never before possible. We use Varilux Physio DRx digital lenses as our standard for ALL progressive prescriptions, unless requested otherwise. Varilux Physio DRx Digital Lenses: Varilux DRx digital lenses use a unique three-step process for superior back side digital lenses. Design – Superior Varilux designs specifically created for back side digital lenses which integrates the results of real-wearer testing at each stage of the lens design. The Live Optics process creates a lens design that more accurately complements the human design. Lens – High quality Essilor semi-finished single vision (SFSV) lenses which allows for design accuracy every time. Using a dedicated SFSV lens produces consistent precision in the finished product. Process – Proprietary Essilor Digital Surfacing Process Control (DSPC) ensures consistency and quality. Only Varilux mandates every certified laboratory tests and calibrates its digital processes daily. DSPC delivers Varilux performance and quality on every Varilux DRx lens. Upgrade from Varilux Physio DRx to either Varilux Physio W3+ or Varilux S Design digital progressive lenses for the absolute best in today's progressive digital lens technology. Varilux Physio W3+ Digital Lenses: Varilux Physio W3+ digital lenses are the latest range of Essilor of America, Inc.’s Varilux progressive lenses. These designs feature W.A.V.E Technology 2TM, Essilor’s next generation of lens technology that manages distortions to deliver sharp vision at every distance, even in low light. Varilux Physio W3+ lenses also have an excusive Binocular Booster that uses the prescriptions from both eyes to calculate the lenses as a pair. Varilux X Series Digital Lenses: Essilor has launched its latest innovation to enhance the visual experience of presbyopes – going one step further in understanding the evolving needs of wearers and putting them at the heart of its innovation process. Group designers have focused efforts on improving vision at arm’s length – reflecting the multitude of near vision tasks of today’s lifestyles. The Varilux® X series™ in particular has been designed to meet the ever-changing expectations of Generation X, consumers born between 1965 and 1980, who are highly active, digitally connected and don’t want to be limited by their vision. But it’s also a progressive lens that ensures quality vision at every distance for all active presbyopes. By re-shaping a specific zone in the lens, it overcomes a typical frustration with many progressive lenses – having to adjust one’s head to find the right angle. The Varilux® X series™ lens is the result of innovation in lens design with Xtend™ technology which delivers additional benefits for today’s near vision demands. Combined with a new calculator Essilor is able to design each lens with much greater precision taking into account multiple targets for one gaze direction. Currently only available for progressive Polycarbonate, Trivex, High Index 1.60 and High Index 1.67 Lenses. Plastic Lens: Plastic Lens or CR-39 have a refractive index of 1.53. It has comparable scratch resistance to glass and offers a low price solution for prescription lenses. Polycarbonate Lens: Polycarbonate Lenses have a refractive index of 1.59. It is 35% thinner and 45% lighter and flatter than plastic lenses. It is 10 times more impact resistant and three times more scratch resistant than plastic. 100% UVA/UVB Protection. Ideal for rimless, drill mount frames and highly active people. Trivex Lens: Trivex Lenses have a refractive index of 1.54 and are ultra lightweight. It has similar impact resistance to polycarbonate but is more scratch resistant. 100% UVA/UVB Protection. Ideal for drill mount frames and highly active people. High Index Lens: High Index lenses represent the latest lens technology available today, it enhancing cosmetic appearance and offering perceived added value. High Index lenses reduce the thickness and weight of an eyeglass lens, particularly for individuals with a strong prescription. Need help determining what lens material is best for you?! We have created a guide just for this HERE. Anti-Reflective Coating: Recommended with every prescription. Anti-Reflective Coating decreasing reflection and even makes frames aesthetically look better. It helps produce less glare, which is particularly noticeable when driving at night or working in front of a computer monitor. The decreased glare means that wearers often find their eyes are less tired, particularly at the end of the day. Allowing more light to pass through the lens also increases contrast and therefore increases visual acuity. Choosing any of our Crizal AR Coatings will also provide you with a 2 year lens warranty. We suggest Crizal AR Coatings as they are the best in the industry. Armor 2 Year AR Coating - Our premium in-house Armor AR Coating | Includes a 2 year lens warranty | Can be used on clear and tinted lenses | MOST POPULAR FOR NON-POLARIZED SUNGLASSES! Crizal Avance AR Coating - Represents one of the best Anti-Reflective Coating available today | Reduces glare, repels water, resists scratches and smudges better than most other AR Coatings | Includes Scratch Resistant Coating | Includes UV Protection | Includes a 2 year lens warranty | NOT for Sunglasses | MOST POPULAR FOR EYEGLASSES! Crizal SunShield AR Coating | Xperio UV - Represents the best backside Anti-Reflective Coating for sunglasses available today | When paired with a polarized lens it makes it a Xperio UV Lens. A lens rating of E-SPF® 50, meaning that an eye protected by the lens will receive 50 times less UV exposure than an unprotected eye | Delivers the sharpest vision of any no-glare lens on the market | Reduces the most glare, repels water, resists scratches and smudges better than any other AR Coating | Includes Scratch Resistant Coating | Includes UV Protection with an E-SPF of 50+ | Includes a 2 year lens warranty | MUST be paired with the Polarized Lens Option | MOST POPULAR FOR POLARIZED SUNGLASSES! To view the different benefits of each Crizal Anti-Reflective Coating click HERE. UV Ultraviolet Protection: UV Protection will shield your eyes from the sun's UVA and UVB rays that are damaging to the eyes. Scratch Resistant Coating: Scratch resistant coating is ten times less prone to scuffs and scratches than uncoated lenses. Prevent your new lenses from everyday dust and particles that can impair your sight over time. Roll Lenses: Rolling the lens is great for patients that have a high prescription. This will help to hide the lens thickness and make the lenses aesthetically look much better in your new frames. Generally makes the lens look better from a side profile to look smoother and to not have such a straight edge. Polish Lenses: Polishing the lenses will make the lens aesthetically look better and give it a "disappearing effect." Ideal for rimless frames and patients with higher prescription. TRANSITIONS Signature VII Lenses: Introducing the most adaptive UV responsive lenses with optimal indoor clarity currently available in the industry. This new addition to the Transitions family of products features a ground breaking technology, CHROMEA7. CHROMEA7 Technology is a unique dye formulation that keeps more molecules activated to absorb more light, allowing for a better, more responsive lens in a variety of lightning conditions. Transitions VII is now 20% faster activation than Transitions VI. Grey tint is now 15% darker and brown tint is now 21% darker. The same great Transitions lens just got even better. Available in Grey, Brown or Green/Graphite (G-15) tint. Click HERE to view these colors. TRANSITIONS Colors Lenses: Introducing the newest addition of colors to the TRANSITIONS family. Featuring exclusive Chromea7 ™ photochromic technology, this is our fastest and most responsive lens in all light and temperature conditions. Available in a range of colors, including four vibrant new style colors, our Transitions ® Signature ® lenses personalize any frame, allowing you to further express your style. Pick your color, choose your style. Available in the colors Amber, Emerald, Sapphire and Amethyst. Click HERE to view these colors. TRANSITIONS XTRActive Lenses: All day Transitions XTRActive lenses adapt to help protect your eyes from fatigue and strain caused by UV light and bright glare outdoors, and even activate behind the windshield. Indoors they have a comfortable hint of 10% tint to shield your eyes from strain caused by harsh indoor light. Available only in Grey tint. TRANSITIONS Drivewear Lenses: Daytime light and weather conditions constantly change while driving and so do Transitions Drivewear sun lenses. Their NuPolar® polarization removes glare off the road and car hood. Transitions® photochromic technology adjusts the color and tint of the lenses as light conditions change, providing ideal color and clarity for driving. Drivewear always has a 40% tint to shield your eyes from strain caused by the reflection of the road when driving. Available only in Brown Polarized tint. TRANSITIONS Vantage Lenses: Transitions Vantage Lenses provide even crisper, sharper vision outdoors, even in the brightest outdoor glare. Transitions Vantage are the only lenses in the industry with variable polarization that adjust to match outdoor levels. Indoors they have a comfortable hint of 10% tint to shield your eyes from strain caused by harsh indoor light. Available only in Grey Polarized tint. Polarized Lenses: Light reflected from surfaces such as a flat road or smooth water generally is horizontally polarized. This means that, instead of light being scattered in all directions in more usual ways, reflected light generally travels in a more horizontally oriented direction. This creates an annoying and sometimes dangerous intensity of light that we experience as glare. Polarized lenses contain a special filter that blocks this type of intense reflected light, reducing glare. We offer a wide variety of polarized lens colors, please click HERE to view all the colors available as well as each color's specifications. Please Note: We do a Polar 3 Lens (the darkest polarized lens) as our standard for polarized lenses, unless requested otherwise or a custom color is chosen. Polarized Custom Colored Essilor Lenses: Specialty polarized lenses offered in a solid, gradient and mirror tint. Choose from 6 solid polarized colors, 6 gradient polarized colors and 3 mirror polarized lenses. Light reflected from surfaces such as a flat road or smooth water generally is horizontally polarized. This means that, instead of light being scattered in all directions in more usual ways, reflected light generally travels in a more horizontally oriented direction. This creates an annoying and sometimes dangerous intensity of light that we experience as glare. Polarized lenses contain a special filter that blocks this type of intense reflected light, reducing glare. Essilor offers a variety of polarized lens colors, please click HERE to view all the colors available. Please input specific color in the "Order Comments" section at the very end of the checkout. Please Note: ONLY available in Plastic or Polycarbonate lens material. You MUST also choose the Crizal Sunshield AR Coating option with this polarized lens, making it an Xperio UV Polarized Lens. Lens Tinting (Solid or Gradient): Add tint to your lens with solid or gradient tinting, available in black, grey, brown or any other single color tint. Please input specific color in the "Order Comments" section at the very end of the checkout. To be the most accurate please email us with an image of the tint you desire. Please Note: High Index lenses do not tint really dark. If you want a very dark lens and your prescription requires a High Index lens, we recommend choosing the polarized lens option to achieve this. CustomEyes Sun Clip: High-end custom clips, handmade with precision stainless steel and colored to perfection for all your eyewear. Matching all frame colors and tinting lenses to colors you want. A completely custom sun clip to fit any frame you desire. 100% UVA and UVB protection available in tinted non-polarized or polarized lenses. Please click HERE to see images of previously created sun clips. Includes a special hard case just for your sun clip. Once we receive your order we will contact you to inquire what you desire in your new sun clip. Please Note: This process takes about 2 weeks to create from the day your lenses are complete and/or your frame arrives. For any custom color tinted lenses or custom mirror tinted lens, please specify in "Order Comments" section at the very end of the checkout. Mirror Tinting: Mirror tinting is a reflective optical coating on the outside of the lenses to make your lenses appear like a one-way mirror. Mirror coatings blocks additional sunlight and reduces harsh glare by 10-15% with a solid mirror and by 5-8% with a flash mirror. We offer a wide variety of colors and gradient mirror, please click HERE to view all the mirror tint colors available. Price includes tint behind the mirror coating. Please input specific color in the "Order Comments" section at the very end of the checkout. Tinted Lens Kit: Many times patients want to change the look of their glasses by simply adding a custom colored lens to their frame. The Tinted Lens Kit includes non-prescription plastic lenses with UV and Scratch Coating, all in one price. We can do ANY single color of tint in a solid or gradient effect. To be the most accurate please email us with an image of the tint you desire.